At the new Pho Viet’s II in Newton Centre, broth is bubbling in stockpots as a steady stream of customers come in for a bowl of pho to warm away the winter chill. The Tran family recently opened the eatery, but their steaming, aromatic noodle soups have had a loyal following for years from their first outpost — Pho Viet, a stall in the food court at the Super 88, an Asian food market in Allston. “We have always been looking for our own restaurant,” says Jenn Tin, daughter-in-law of owners Hung and Dung Tran, and married to their son Thanh. The Trans, who are of Chinese descent, lived in Saigon before immigrating in the early 2000s to California, and then later moved to Boston. Anh Tran, the family matriarch now in her 70s, came earlier and was the first to start the business using her authentic recipes. 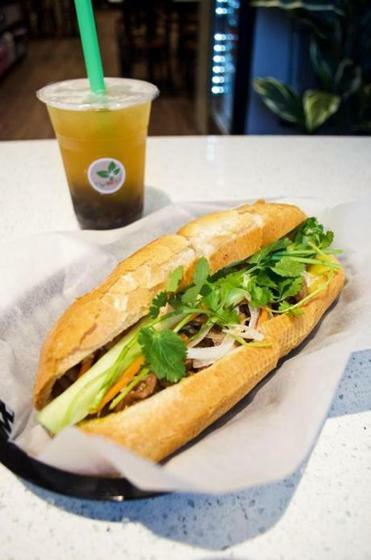 Banh mi, the Vietnamese sandwich with French roots, and with layers of flavors, is also one of Pho Viet’s specialties and a standout here ($6). The baguette is toasted and crackly, its interior warm and soft and slathered with house-made mayonnaise and fish sauce. Slices of spiced grilled meats marinated in lemongrass (either beef, pork, chicken) or tofu are generous and tucked inside, topped with strands of pickled daikon and carrots piled high. Slices of jalapeno insert some heat; long stems of cilantro and a stick of cucumber the length of the bread add cooling. The restaurant has 30 seats and the menu matches the one at the Allston supermarket. “We replicated the food court style,” says Tin. “You order at the counter, there’s no server, no tipping, and you clean up yourself and you’re out the door. Just come in and enjoy the food.” 51 Langley Road, Newton Centre, 617-527-8810, www.phoviets.com.